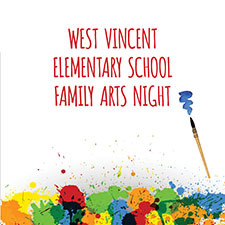 We hope you can join us for our West Vincent Family Arts Nights this fall and spring. Hop Toad Studio will lead us in a canvas painting project that will create a family masterpiece! This event is open to all families with students at the school, but space is limited. Registration is required. Please contact Anne Strawbridge with any questions. Hope you can join us! Registration is Full for the April event. Volunteers Needed for Family Arts Night!